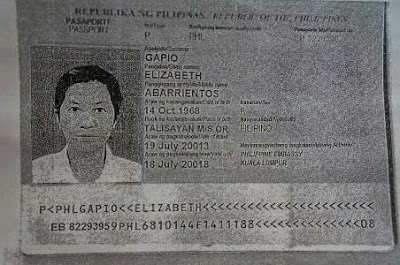 A photocopy of a fake passport. Spot the mistakes? Ever since I wrote the post on How to apply for maid's JP visa yourself, I've received tons of comments and questions asking for advice. I'm no pro in this field but I try my best to help employers (and even maids/workers) who are clueless about the system. From all the comments and feedback, I gather that employers are getting more desperate due to the long waiting period and the steep agency fees which come without any guarantee that the new hire is going to be acceptable (chances of getting a good maid is 1%, thus acceptable is a better word). I also have workers who wrote in to me regarding their employers who insisted them to foot their own cost of work permit renewals, as high as RM 3,000! There were more complaints about maids these days too, from stealing to lying and runaways. Due to all those problems, no doubt it gives rise to bogus agents who claim to be able to do illegal stuff in a legal way with a fraction of the cost. Some employers asked me, "Sounds too good to be true?". Of course! If you don't know already, there's no free lunch in this world. And these bogus agents love to target runaway maids who need new passports or work permits as much as a desperate employer who's urgently in need of a maid. Overstay - Renewal of maid's work permit which has expired months or years ago without having to pay overstay penalty or face deportation. Transfer of maid's work permit after her contract expires without having to go back to home country and serve the cooling off period of 3 months. Renewal of maid's expired passport and issuance of a new work permit under new employer's name. Issuance of new passport, complete with police report of lost passport and a new work permit under new employer's name. Provide temporary maid under other employer's name to you for more than 2 weeks. Free lancers (maids) who claim to have their own visa/work permits. There you go. All the above are illegal and not do-able! So when some self proclaimed agent comes to you and offer some of the services stated above for a mere RM 5,000, run! If you're thinking twice (or trice) about trusting the bogus agent, let me highlight to you the consequences that may happen along the way. Hiring a maid who doesn't has a work permit under your name violates Rule 39(b) Immigration Regulations 1963 (Malaysia) that upon conviction is punishable by a fine of not exceeding RM 1,000 or imprisonment not exceeding 6 months, or both. Maids who claim to have own work permits are illegals. They are either runaway maids or their work permits are fake. No other possibilities for sure. Harboring illegals are punishable under Section 55 B, Section 55 E and Section 56 (1)(d) of Immigration Act 1959/63 in Malaysia. Agent keeps asking for more payment along the process. No refund on previous amount paid if you decide to drop the application/renewal. Therefore, you have no choice but to keep paying since your maid's passport should be in agent's hand by now. Agent disappears with your maid's passport and the partial payment. Getting caught by the enforcer! The worst part is you can't lodge a police report when any of that happens because you're paying for an illegal service in the first place. So no, don't hire through black market. Illegal maids and agents don't solve your problems, they will make it worse for you. Read on the offences and penalties for overstaying, breach of pass/permit's conditions and harboring illegals here. Sorry for my late reply. From the way I see it, there are 2 ways to solve this & it's not going to be easy. 1) Bring your aunt & her maid to the embassy & seek for help. Usually they will help to send the maid back without any legal action taken against her. That's the best way. 2) Use an agent who has insider with the immigration to settle it. However, you will need to pay some money to 'settle' your maid's overstay. Don't bother sending the maid back to her agent, she will recycle her for other employers. And you also cannot send her directly back to her home country because she overstayed. Best is if you seek help from the embassy. Explain your situation, ask maid to talk to the embassy people too. Hope it will solve the problem. Thanks for the advice. I think we will indeed call the indonesian embassy for help. Appreciate it.